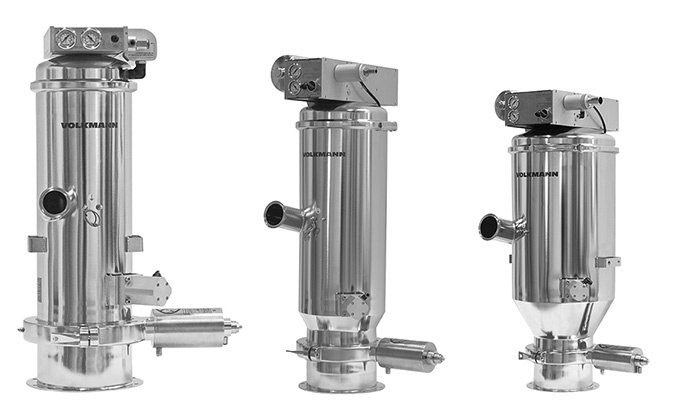 The PPC Series of Pharmaceutical Vacuum Conveyors from Volkmann were developed to meet the demanding requirements of the pharmaceutical and other industries for top quality materials, surfaces and characteristics of all parts in contact with the conveyed materials. These high quality, cGMP vacuum conveyors are used primarily by the pharmaceutical and color/lacquer industries. The PPC series of vacuum conveyors features a one-piece, gap-free design for their separator elements that is completely electrical conductive. This design eliminates spaces where product might remain, and optimizes frequent product changes with easy, absolute cleaning of the process machinery to avoid product contamination and meet the highest quality standards. Units are easily dismantled without tools, can be cleaned quickly and can be sterilized – see how. PPC Vacuum Conveyors are fitted with a large butterfly valve at the discharge. This, too, can be easily dismantled without tools. PPC Vacuum Conveyors are offered as pre-configured units to suit the individual application. Customers can choose from a variety of pharmaceutical or electrical conductive filter systems (e.g. for hazardous inflammable materials). Special coatings, clamp modules, valve assemblies, WIP/CIP systems are available upon request.